Top 20 Most Charming Anime Characters of 2018 (Charapedia) – Desuzone '+g+"
Charapedia ask 10.000 anime fans to choose the most charming character for anime that aired in 2018, during January to December. 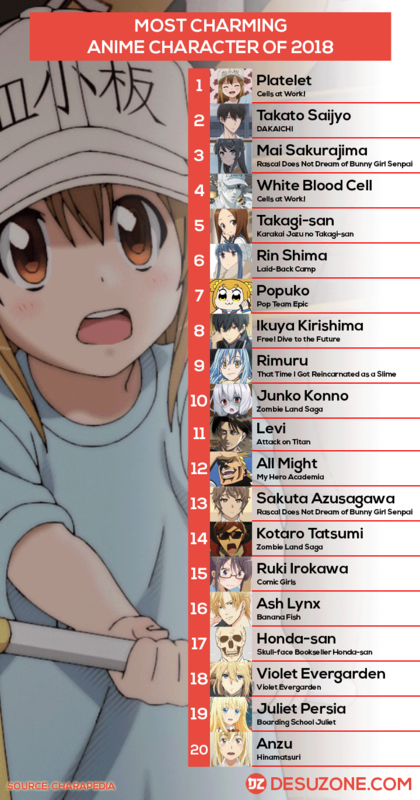 The winner is Platelets from Cells at Work! anime series and followed by Takato Saijyo from DAKAICHI -I'm being harassed by the sexiest man of the year-.